Soft, creamy quark is fantastic blended with rich, dark chocolate and a luxurious dash of brandy in this indulgent dessert. Place the chocolate in a heatproof bowl over a saucepan of lightly simmering water and heat for 8-10 minutes or until melted, taking care that the base of the bowl does not touch the water. Put the quark in a blender or food processor with the sweetener, brandy and vanilla extract. Scrape in the melted chocolate and blend until smooth. Transfer this mixture into four small dessert glasses or ramekins, spoon over the vanilla yogurt and top with a cherry. These are delicious served with a dusting of cocoa powder and icing sugar. 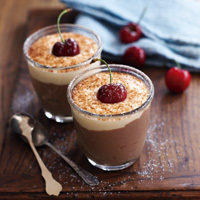 These chocolate pots are even tastier after a bit of time in the fridge so, if you can, make them in advance and chill until you’re ready to eat.